1. Odell Beckham Jr.-WR-Giants- The 1st round draft pick who will become an almost every down player will be the logical pickup here to replace Victor Cruz who was lost for the season on Sunday night. Rueben Randle will get more targets and even little used Preston Parker could see some additional action but is recommended only in deeper leagues. Beckham Jr. is already owned in 38% of Yahoo! leagues mainly off of his breakout week vs the Falcons. 2. Branden Bolden-RB-Patriots- We’ll preface this pick by saying you should temper your expectations when selecting a replacment for Ridley. Although Bolden should see the bulk of the reps, expect him to platoon with James White and even Jonas Grey. Only those desperate for a body at the RB position need bother here. 3. 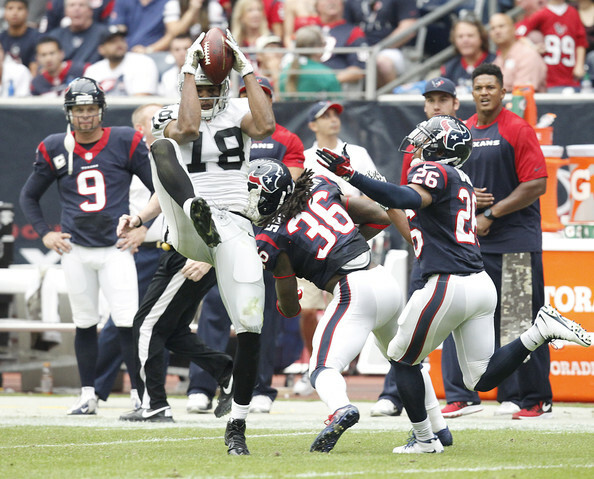 Andre Holmes-WR-Raiders- Listen fantasy owners, Holmes is the “real deal”! Becoming one of QB Derrick Carr’s favorite targets, Holmes has turned it on over the last two weeks against the Chargers and Dolphins as he amassed 195 receiving yards on 20 targets with 3 touchdowns. Only owned in less than 10% of leagues, Holmes should be owned in all mixed leagues & formats. 4. Josh Hill-TE-Saints- With Jimmy Graham (shoulder) out for 2-3 weeks, Hill will make for a serviceable replacement. He already has 7 receptions for 112 yards and 2 touchdowns on his resume so far this season. The 24 year old averaged over 17 yards a reception last week and is gaining the trust of Drew Brees with every game. Hill is widley available as he is owned in less than 5% of most leagues.